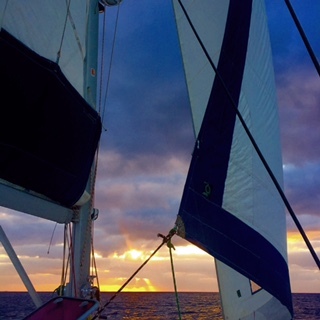 We continued sailing east today, and a little to the north along the coast of Puerto Rico. It rained much of the night and continued to rain on and off throughout the day. All through the night, lightening and thunder boomed around us, and at one point the girls came in to tell Danny that the plug by the microwave was smoking. He went to turn off the AC power but the breaker had already switched, and after pulling the plug from the wall, one could see the black marks and melted plastic. We thought at first we’d been hit by lightening, but all the rest of the boats electronics were fine. Some may think the scenes from today to be dreary, but I thought it was beautiful, and for the first time in a long time, nice and cool due to Katabatic winds. Danny taught me about these fancy pants winds while he and I sat at the helm. They are a drainage wind that carries air from high elevation down a slope forced by gravity. They are commonly known as Fall winds. 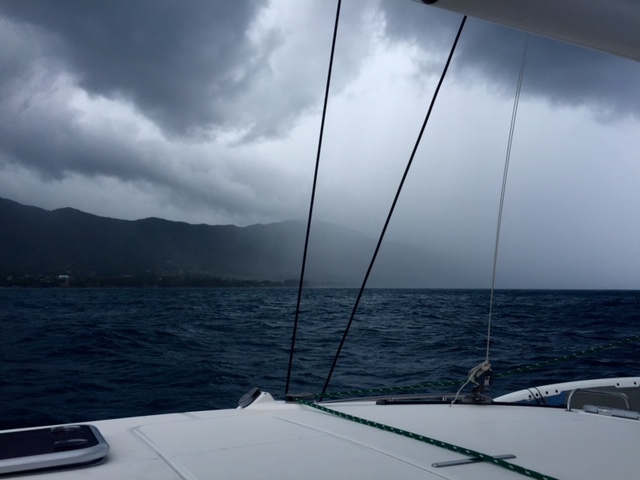 As we neared Palmas del Mar, in the distance we could see a heavy rainstorm, and skirted around it. 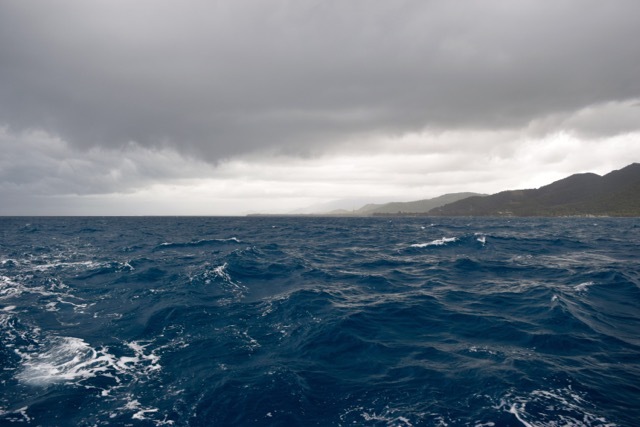 I love the way it looks when rain is falling on the ocean. Once it cleared for the most part, we once again sailed a little closer to land, and I was reminded of scenes from when I hiked a cloud forest in Ecuador a few years ago. The community surrounding our marina is an interesting one. About 3500 condo’s and homes surround it, half of which are year round residents. We like the look of the cave at the entrance! I love reading about your wonderful adventures! Please keep them coming. Stay safe and be careful. Thank you Deb, we love that you join us in spirit. Many more exciting days/years ahead!